Car Accident Insurance Claims | Miami Auto Injury Lawyers Gerson & Schwartz, P.A. Filing an auto insurance claim after a crash is necessary, but it can quickly fray your nerves. Worse, going it alone without the benefit of a Miami car accident lawyer could cause you miss out on payments to which you are entitled. 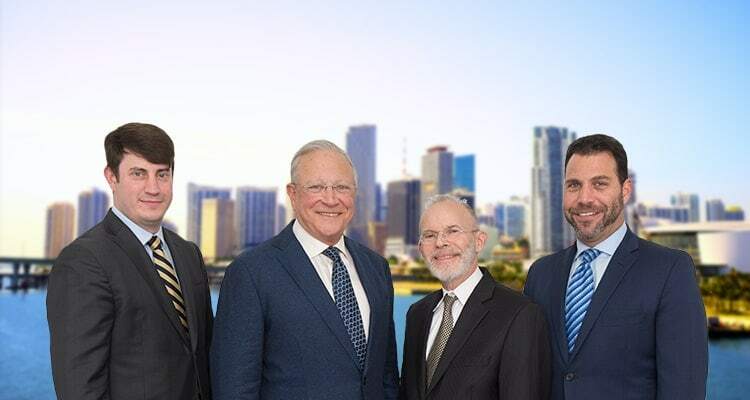 At Gerson & Schwartz, P.A., our firm has nearly five decades of experience and a long track record of success in negotiating favorable settlements and winning verdicts for our clients. Dealing with car accident insurance companies is something we have experience in. Most consumers Florida are unfamiliar with the claims process. After an accident, insurers, either your own or a third-party’s may contact you early on to rope you into an agreement. They may even strong-arm you with phrases like, “final offer.” The truth is, that final offer is likely not the best you can get, though without legal representation, you may lack the leverage to assert that. Plus, many insurance settlement agreements contain provisions that require you to sign off on any future claim of damages or claims against other parties. You could be cutting yourself off from other avenues for rightful compensation of which you may not even be aware. Contacting a lawyer who specializes in insurance claims is important to avoid getting lured into some of insurance company tactics and strategies. It is not uncommon for insurance companies to deny claims outright or to offer settlements for far less than a claim is worth. Having a personal injury attorney who understands how best to negotiate with insurers helps improve your chances of a fair settlement offer. It should be noted that all insurers are legally bound to act in good faith, and failure to do so may result in additional litigation and compensation. The first step to understanding how much your claim could be worth is having a grasp of the different types of auto insurance available. The unique circumstances of your car accident will dictate which type of benefits you can access. Below, are couple examples of insurance that may be available if you were injured. Florida is a no-fault state when it comes to auto accidents. All drivers are required by law to carry personal injury protection (PIP) insurance, which will provide insurance to one who is injured, regardless of fault. 80 percent of medical costs. 60 percent of wages lost. Mileage reimbursement to-and-from your physician. However, benefits are only available up to $10,000. Legislative changes to the law in 2013 require a person be diagnosed as requiring emergency care after an auto accident in Miami before they can access this full amount. Otherwise, the most one can receive is $2,500 under PIP. PIP provides coverage to the person named on the policy, resident relatives of the named insured, passengers in that car (if not covered by their own PIP benefits) other persons struck while not in their own motor vehicle (i.e., pedestrians and bicyclists). Florida law requires anyone wishing to file a third-party insurance claim have sufficiently “serious” injuries exceeding that $10,000 threshold. Coverage for bodily injury liability pays for serious or permanent injury or death to others when an insured causes a car crash. An insurance company is only required to pay damages for injuries up to the limits of the policy unless they are determined to have acted in bad faith. Insurer’s will also provide a defense or legal representation to their insured, or someone covered under an insured’s policy. Car Crashes caused by the insured, as well as a resident relative or an insured driving someone else’s car, should be covered by the bodily injury liability policy. While bodily injury liability insurance is not mandated to register a vehicle in the Sunshine State, the Florida Financial Responsibility Law, Florida Statute Chapter 324, requires anyone who causes a crash with injuries provide a minimum of $10,000 per person and $20,000 per crash for bodily injuries. If the person does not have insurance and can’t pay that amount out-of-pocket, he or she could lose their license. Commercial vehicles - because of the extent of damage they can inflict, must carry additional coverage. Florida Statute 627.742 requires private buses to carry at least $100,000 per person/ $300,000 per accident in liability coverage. Florida Statute 627.7415 mandates commercial vehicles between 26,000 and 35,000 pounds to carry $50,000 in bodily injury coverage. Vehicles that weigh 35,000 pounds to 44,000 pounds must carry $100,000 in bodily injury coverage per accident and vehicles more than 44,000 pounds must carry at least $300,000 per accident. Leased vehicles - Under Florid law leased vehicles to maintain insurance coverage for bodily injury of 100,000 per person and $ 300,000 per accident. Florida Statute 324.023 requires drivers convicted of a DUI in the last three years to carry bodily injury liability coverage of $100,000 per person and $300,000 per accident. In general, it’s recommended motorists carry more than the minimum amount, as costs for serious bodily injuries and death resulting from a car accident will far exceed it. Uninsured/ underinsured motorist coverage (also referred to as UM/UIM), is not technically required by Florida law. However, Florida Statute 627.727 mandates all insurance companies must offer it, and can only issue policies without it if the insured turns it down in writing. Here’s why you need it: Although state law requires all drivers to be insured, not all drivers follow the law. In fact, 1 in 4 drivers in Florida lack insurance, according to the Insurance Research Council. Beyond that, even those who do have insurance may merely carry the minimum. In Florida, that’s only $10,000 in personal injury protection, $10,000 in bodily injury ($20,000 per accident) and $10,000 in property damage. A serious crash could result in incurring medical bills that are easily ten times that amount – and that doesn’t include losses for being unable to return to work or consideration for future medical expenses and lost earnings. On top of that, South Florida (Miami especially) has been plagued in recent years by a spate of hit-and-run crashes. UM/UIM coverage steps in to make sure you’re covered in these scenarios. In general, UM/ UIM coverage will be reduced by whatever other benefits you obtain, including bodily injury liability coverage, workers’ compensation coverage and personal injury protection benefits. UM limits are typically equal to or less than the amount of your liability coverage. Excess and umbrella liability policies extend coverage over and above the underlying coverage limits. Although the two terms are often used interchangeably, the main difference is that while umbrella insurance offers excess limits, it also provides broader additional coverage not otherwise available. Excess liability only heightens the limit available, but doesn’t broaden the scope of coverage. If you’re struck by another driver who only had $10,000 in bodily injury liability coverage, but costs for your injuries exceeded $1 million, you would have to look to other sources for recovery. One of those might be to pursue a claim directly against the at-fault driver. The at-fault driver could avoid being compelled to pay that much out-of-pocket (if they even had the assets) with an excess or umbrella insurance policy. Our car accident lawyers in Miami know most excess and umbrella policies are available in million dollar increments, from between $1 million to $5 million. This type of coverage protects an individual tortfeasor’s bank account, home and personal property from seizure, while giving personal injury victims a clear-cut means to recover additional damages.